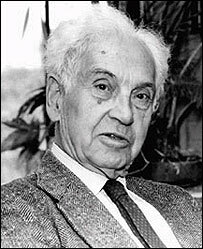 Ernst Mayr, the evolutionary biologist who has been called "the Darwin of the 20th Century" has died aged 100. The Harvard professor of zoology passed away at a retirement community in Massachusetts, US, following a brief illness, his family said. Amongst many achievements, Mayr may be remembered most for pioneering the modern definition of a species. Born in 1904 in Kempten, Germany, into a family of doctors, he broke off his medical career to become a zoologist. William C Kirby, a professor of history and Dean of the Faculty of Arts and Sciences at Harvard, said Professor Mayr's contributions to the field of evolutionary biology were "extraordinary by any measure". Throughout a career spanning nearly 80 years, Mayr maintained an unshakeable faith in Darwinian evolution in the face of revisions by other biologists and attacks by anti-evolutionists. "I'm an old-time fighter for Darwinism," he told the university magazine, the Harvard Gazette, in 1991. "I say, 'please tell me what is wrong with Darwinism. I can't see anything wrong with Darwinism'." In his travels in Papua New Guinea and the Solomon Islands, Mayr demonstrated how new species arise from isolated populations. His work helped establish the origin of species diversity as the central question of evolutionary biology. And his definition of a biological species - an interbreeding population that cannot breed with other groups - is the most widely accepted one today.